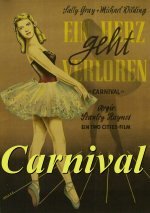 Carnival is a great movie, and a great story, but the wonderful Jean Kent is truly wasted in such a small role. The actress who played Jenny Pearl was harder to warm to than Miss Kent would have been in the same role, and it's a shame their casting wasn't reversed. That said, the role of Irene was quite similar to that of Lucy in "Fanny By Gaslight", though drastically smaller. Jenny Pearl is a beautiful girl born into a poor family.She can't keep away from the stage and performing from a young age and, with friend Irene, becomes a ballet dancer, with no shortage of male suitors. However, she pushes away the one man she truly loves and ends up marrying another, after her mother's death, to provide security for herself and her crippled sister, May. This ultimately ends in tragedy for all involved.